Four persons parading themselves as operatives of the Federal Special Anti-Robbery Squad have been gunned down in Rivers State. 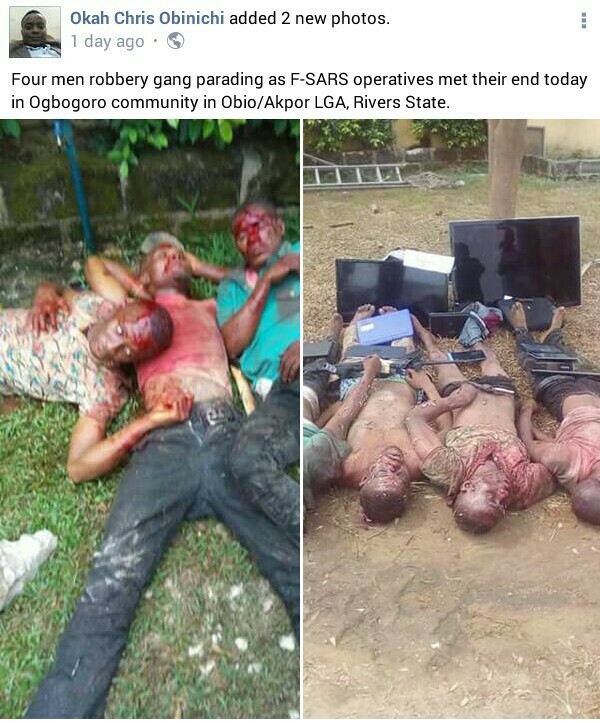 The suspects were killed by F-SARS on Saturday at Ogbogoro community in the Obio/Akpor Local Government Area of Rivers State following a distress call from an unidentified member of the public. 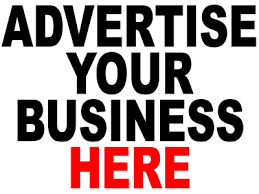 This was as armed robbers, who operated around the Iloabuchi area of Mile 2 Diobu, Port Harcourt City, on Saturday night, killed a policeman in the area, leaving a local vigilante member and other persons with bullet wounds. It was learnt that the vigilante member and the other persons, who were hit by bullets, had been hospitalised. A source, who did not want his name in print, told Punch correspondent that the criminals were spotted to be fake security operatives by residents of the area. 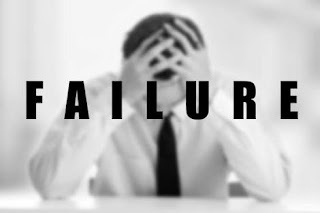 It was gathered that a resident of the area called Ozuoba Police Station. The source said when SARS operatives entered the community, the fake SARS men engaged them in a gun duel. 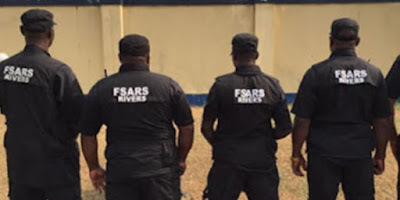 The Commander of F-SARS in the state, Mr. Akin Fakorede, who confirmed the development, said his men killed a four-man robbery gang that disguised as SARS operatives to rob some residents. Fakorede said the criminals engaged the SARS men in a gun battle, adding that his men overpowered and killed the hoodlums. He noted that the same gang had earlier this year killed a taxi driver operating in the area. Fakorede said, “A four-man robbery gang with their AK-47 rifles, impersonating as SARS operatives, met their end on December 16, 2017 at Ogbogoro. The gang had gone to rob one Mr. Wey Nwinanadun. “They went to rob Nwinanadun at his residence in Ogbogoro; the gang had previously robbed in the Ada George and Iwofe area of the City. When contacted, the Public Relations Officer of the state Police Command, Mr. Nnamdi Omoni, confirmed that a policeman was killed at Iloabuchi area of Port Harcourt, describing it as a great loss. Omoni noted that the Commissioner of Police in Rivers State, Ahmed Zaki, had already launched a manhunt for the culprits and promised that the killers would be apprehended and prosecuted. He vowed that the police would not be deterred in their efforts to rid the state of criminals, stating that officers have been drafted to strategic locations to ensure an effective policing of the state.